Male-Grey head and upperparts; green and cheeks; area around eyes green; blue tinge on forecrown; black chin and stripe on lower cheeks; black collar encircling hindneck, bordered below by green/blue band; green/blue lower back to upper tail coverts; green upper wing coverts scalloped with yellow/green; yellow/green underparts washed with pale blue; blue central tail feathers tipped with yellow, the side tail feathers green tipped with yellow; red upper mandible tipped with yellow, brown lower mandible. Eye yellow. Female-Green/blue band around hindneck absent; green on face and forecrown minimal; pale green mantle, breast and abdomen, often suffused with grey. Bill black. Grey of head and upper parts green instead; black stripe across cheeks and around collar duller and narrower; blue/green band under black stripe absent. Bill pale orange in very young birds. Eye grey. Calls are discordant and shrieky; also scolding. Also sharp notes repeated in short bursts. 3 x 1 x 2m (9.8 x 3.3 x 6.5 ft) outside aviary in warm temperatures, with adjoining inside aviary, or walk-in avairy minimum length 4.5m (14.7 ft). Use metal construction. Seed mix of safflower, millet, canary, buckwheat and some sunflower; millet spray; fruits such as: apple, pear, banana, cactus fruits, orange; vegetables such as: carrot, celery, peppers, green beans and peas in the pod; green leaves such as: Swiss chard, lettuce, sowthistle, dandelion and chickweed; egg food for rearing; complete pellet. Bird-safe (unsprayed and non-toxic) branches with blossoms, pine, elder, willow and fir boughs, vegetable-tanned leather toys and wood block toys. Light bather, so provide overhead misters or shallow water bowls. Vertical box 9" x 9" x 24" (22.8cm x 22.8cm x 61cm). Species has a restricted range, may be in danger from habitat loss. Western Ghats, India from lat. 19N south to S Kerala. Found from 450-1000m (1476-3280 ft) in upland evergreen rainforest, both primary and secondary. Also found in deciduous forest with bamboo and abandoned coffee and rubber plantations. Feeds on seeds, fruits, particularly wild figs, buds, flowers and nectar. May take sorghum and fruit crops. Found in family groups or small flocks. 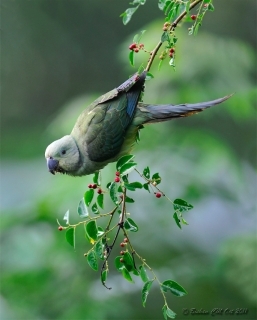 Associates with Plum-headed Parakeet at lower elevations. 4 spherical eggs, 28.0 x 24.5mm (1.1 x 0.9 in).